Most everyone overeats around the holidays, its hard not to; food is one of life’s great pleasures; sharing it with people you love is even greater. So, at the end of December, when you have eaten too much, and too richly, take a few days and rest your digestive tract which has been working overtime by making a Winter Cleanse Soup with “strong” vegetables that nourish and cleanse the body. Here is a cleanse method especially suitable for winter, in that it preserves the integrity of the digestive fire and body’s warmth, and is in soup form, which is ideal for this season. It’s a cleanse that does no damage in the process, like the kinds of cleanses you buy in the health food store with their “heroic” purgative herbals do. 2 quarts water, more or less. 1 burdock root, sliced lengthwise and chopped a bit. Place all the ingredients except the parsley and greens in a large pot with the water and bring to a low boil. 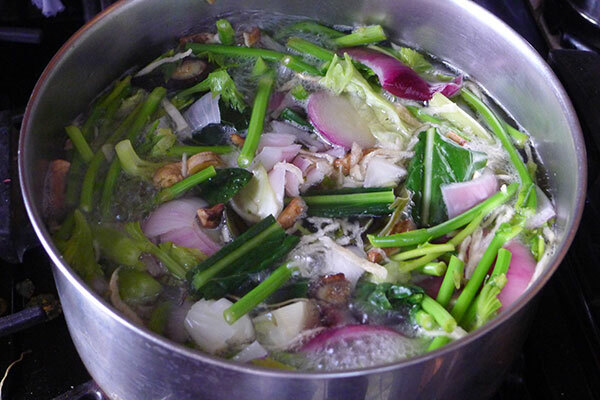 Low boil until the vegetables are almost fully cooked, and add the greens. Simmer until the greens are well darkened. Allow to cool and strain into a glass jar or stainless steel pot. Drink a tall glass of this first thing in the morning, and at least three times a day for two days. The rest of the day eat just small amounts of very simple, low-fat, low protein food, like whole grain sourdough rye , cooked starchy and green vegetables, like potato and broccoli. If you need protein, try some tempeh roasted over a low flame in a cast iron pot with ginger or tofu and bean sprouts stir fried with a green veggie. Delete the beet if you don’t want the red color. If you want it more savory or sweeter, add a sliced yellow or red onion. If you must, add some sea salt to taste. You could also use this basic recipe, or a variation, for miso soup. Just add some mellow or sweet white miso at the end and simmer for three minutes. As the basis for a meal you could add some fish, like halibut or salmon or scallops and cook the veggies a little less long, and serve them with the fish over buckwheat soba, having the broth at the side. Who says you can’t eat your cake and have it, too?! Eden brand Soba and Udon are excellent. The idea here is to liberate the minerals and other nutrients from the cellulose of the vegetables and into the broth, so don’t worry about over-cooking. Keep the heat relatively low. This is more like cooking Chinese herbs; when the soup is cooked all the goodness is in the broth, and the veggies you can eat or compost. It’s well worth searching out dandelion greens. Whole Foods Market, Health Food Markets, and Asian Grocers usually have them. So might your back yard! Dandelion greens are a diuretic, and foods eaten over the holidays tend to cause water retention. So this is an excellent remedy. They also have a cleansing effect on the gall bladder. Dandelions are very rich in nutrients. Traditionally, the roots and leaves of the plant have been used as medicines for breast maladies, bloating, digestive disorders, aching joints, fevers, and skin disorders. The leaves of the plant are very rich in vitamins, including A, C, D, and B-complex. They also have high levels of minerals like iron, magnesium, zinc potassium, manganese, copper, choline, calcium, boron, and silicon. The most active ingredient in dandelions, eudesmanolide and germacranolide, are found only in dandelions. Burdock is a traditional cleansing vegetable that is used in East Asia to remove toxins from the blood and improved the function of organs like the liver, kidneys, and intestines, which play a role in detoxification. 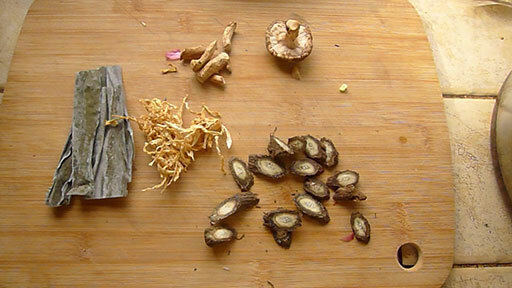 It has gentle laxative, diuretic, anti-bacterial and anti-fungal properties. Black Pepper is a pungent interior warming herb that is excellent for digestion and is used in Ayurveda to reduce phlegm. If you can find Long Pepper, that is also excellent for digestion and the lungs. All three of these spices pacify Kapha, and Coriander also pacifies Pitta and Vata.